On the morning of August 4th, 2001, my wife Lana and I arrived at the Manitou Springs Cog Road Depot. The station is 8.9 miles and about 7,500 vertical feet from the top of Pikes Peak. The train consists of one or two chunky red passenger railcars with wooden benches on either side of a narrow aisle. Huge smelly diesel engines drive the cars up the mountain on a grade that often approaches 25%. Tourists take it all the way to the top. A clear August sky framed the expanse of Pike National Forest that day. There was good Colorado weather and a set of railroad tracks that perspective nearly joined in the distance. It was a good day to travel up the mountain to Barr Camp. The camp is a legacy that rests halfway up the mountain on a trail of the same name. Fred Barr blasted it out of the granite decades earlier. The trail provides access to this intensely beautiful mountain wilderness. Barr Trail is also the route to be followed by both Ascent and Marathon runners. I was going to Barr Camp for acclimatization before the Pikes Peak Marathon, but training in the wonderful natural surroundings was a bonus. We were waiting for our train when Lana called out Joyce! It was Joyce Taylor, getting ready to board the first train. We had a very short and happy reunion. Joyce and I had trained and raced together the previous year. She taught me the cardinal rule of pre-race training, Dont do anything stupid. She was taking the first train to the summit for a preliminary downhill. We would see her again the following day. In fact, over the next couple of weeks, Lana and I would be reunited with several skyrunners, whose acquaintance we made the previous year. Some were elite. Some were plain. All were competitive. An hour later it was our turn. We boarded the Salida car and up we went getting off early at Mountain View trailhead. Our fellow passengers were a bit bewildered over our point of debarkation. Lana and I were the only ones to leave the train in a place that looked like the middle of nowhere. We knew the way. We shouldered our packs and started up the trail. It was a short mile-and-a-half walk to the Spartan camp. Well, Spartan in that Barr Camp has no flush toilet, no shower, no laundry, no television, no convenience store, and no motorized device of any kind. There is shelter, food, water, propane for cooking, and some solar electric to power lighting and ventilation of the single outbuilding. You know, that kind of Spartan. The rustic venue allowed a man to rest and relax. If you are hell-bent on competing in the race that sports rags call the toughest marathon in the United States, then this is the place to train. As we moved closer, Lana pointed up the trail, Theres Matt Carpenter, she said. The man was vigorously hacking away at a hardwood stump at the edge of the trail. The previous year he declared a boycott of the race that he had won so many times. I was disappointed that he would not compete. We walked over to say hello. I asked him if he was planning on running the Marathon this year. He grinned. Well, its always an option. He kept us all in suspense until the morning of the Ascent. We continued the trek for a hundred feet, following the crude rail fence and passing through the front entryway of Barr Camp. A rotating team of caretakers runs the camp. They come from diverse backgrounds. They may be anthropologists, mountain guides, software engineers, or expert trekkers. Love of the mountains and a dedication to recreational safety are the only essential prerequisites for the job. They are a ready auxiliary (albeit unofficial) of El Paso Search and Rescue. They are often the only assistance close enough to help stranded and injured hikers. They maintain the camp, which includes several lean-tos, a large group cabin, and a state-of-the-art, and solar powered, self-composting latrine. There is also a main cabin that serves a social gathering place and where all-you-can-eat meals are served. We entered the main cabin to check in. Dave and Jeff, familiar faces from the previous year were there t o greet us. Jeff assigned us a lean-to shelter on the northeast side, the best option over cabin and tent. We actually displaced Matt who had been bunking there. He would be moving on to another shelter. I protested, but Matt justified his move saying we were paying guests and he was bartering his labor for free meals and a bunk. A short afternoon later, we were having our first supper at Barr Camp. Jeff is an excellent cook, but he is not the only culinary expert ever to spend time on the mountain. Mario DeLaloye, a 71-year-old retired chef from Prescott Arizona made his yearly trek up the mountain that afternoon. He would run the Marathon in 9:37. I hope I can do the same when I reach that age. It was a great meal with good company with many more to come. Mario has been coming to Barr Camp for years. A Swiss transplant, he once ran in the now defunct International category. Mario had a close friend that he introduced me to the following day, a fellow retiree, Tony Garcia from Albequerque NM. Tony, also 71 years of age, finished the ascent at 4:54:03. Together they thoroughly enjoyed camp life and made it fun to be there. Tony and Mario were friends, but they trained separately. Mario felt comfortable with making the 12 mile round trip between Barr Camp and the summit. On the other hand, Tony shunned the quad-busting descent. Like many ascent runners, he would summit the mountain for several days before the event. Once at the top, he would grab lunch at the café, and hitch a ride back down to Manitou Springs. At the bottom he would, from time-to-time, frequent the local eating establishments. Then he would hike back up the mountain, making Barr Camp just before nightfall. Some days he would cover up to 14 miles. Lana and I retired early that first night. 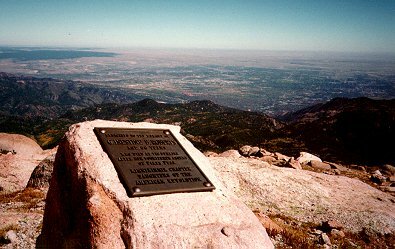 We would summit Pikes Peak three times in the next two weeks and our first trek was to begin early the next day. We planned out the hike with some care, avoiding the mistakes of the previous year. Thats when we charged up the mountain until I turned cyanotic blue at 13,000 feet. I became nauseated and dizzy. We also suffered swollen extremities, mainly fingers, and we both suffered headaches for a couple of days. Its called Acute Mountain Sickness. It passes with acclimatization. In contrast, this year was a slow plodding hike. It took us 6 hours to get to the top and return. We took our time, avoiding physical stress and drinking lots of water. The results were more satisfactory. When we got to the top, we had a burger and some juice at the Cog Wheel Café. They had water there too, so we filled up our Camelbaks. Then we just sort of people watched. Although tourists flocked to the top in great numbers, they never seemed to be quite comfortable. It was not uncommon to see many of them spending a large part of their time at the top in a confused misery; many of them slumped over in the Café booths. Indeed, there is a physical cost of the ascent for the uninitiated. In fact, Zeb Pike, would never successfully summit the peak. The Eastern explorer, in a self-serving rationalization of his failure to reach the summit claimed it would never be climbed. We returned to Barr Camp, and were greeted by Mario and Joyce. We also met Andy Dimmen, an 18-year old who would complete the Pikes Peak Ascent race with an overall 11th place in 2:38:07. As it turns out, Matt and Andy were not only training but also working on the trail for the Ascent and the Marathon. Trail Dogs are individuals who turn big rocks into little ones in an effort to manicure the trail surface. Two such trail dogs had been hired to complete the effort from Barr Camp to timberline. Then the Incline Club (including Matt and Andy) took over, working the rest of the way, to the summit. Each day, the two of them would scream out of camp, heading up the trail to timberline. Once there, they would mash rocks or dig runoffs. Wherever they went, it was always on the run. I never saw either of them walk anywhere. Not everyone appreciated the work of the trail dogs. Many Barr Trail purists thought all the rocks should stay right where Mother Nature put them. The hardships of the trek to the top made it easy to forget that Fred Barrs dynamite moved most of the boulders out of the way in the first place. Still, there were enough of them in the way to make the trail single file in many places. Even after the combined pre-race efforts of the trail dogs and the Incline Club, stretches of Barr Trail remained narrow and precipitous. The second evening passed as easily as the first. Then we retired. I have a hard time sleeping at altitude, but its the essential part of the training. A restless night passed into a chilly dawn. Coffee was essential, and Daves pancakes were great. It was time for my first training run. I refilled the Camelbak and I was off at a shuffling pace that could only remotely be associated with running. This day and several days after I would become anaerobic after very low exertion. My heart rate monitor would read 120, but my calves would burn and sting in a just a few minutes. I chalked this up to the reduced atmosphere above 10,000 feet. I never did become an air burner until the day of my last pre-race ascent. Somewhere around timberline, my altimeter read 12,000 ft MSL. I turned and trotted back down the trail. I reached Barr Camp an hour later. That was the day I met Scott Elliott. He was there on the porch of the main cabin when I returned. I didnt know Scott or his reputation. It was Joyce Taylor who introduced us. She was happy to see him and explained that he had come to train for the Pikes Peak Ascent. Coincidentally, I was there when he and Matt Carpenter exchanged greetings. The open, friendly Carpenter had asked how Elliott had faired in a recent race. Scotts reply was vague and accompanied by lots of nervous arm waving. I sensed some edginess in this encounter. I didnt know until the day I left Barr Camp of the July 25 Boulder Camera story anonymously sent to Matt. It had fashioned Elliott as a champion on his way back to take the King of the Hill title from Carpenter. Almost a month later, the Colorado Springs Gazette piece written by Meri-Jo Borzilleri implied some angst felt by Matt over the tone of the article. In my stay at Barr Camp, I seldom saw the two together. I know they spoke, but were not publicly social. In the days to follow, I grew to respect Scotts ability, but he had personality flaws that made him hard to like. He had a dark, brooding disposition. He claimed to be publicity averse but the number of interviews he granted led me to believe his disdain was mere pretense. He lacked camp etiquette, often dominating the cabins only couch. In general, I found myself avoiding him, even going so far as to avoiding the main cabin when I knew he would be there. Then, just when I thought that I could hate Scott with a clear conscience, he did something selfless and human. About 7 days into our stay at Barr, Lana ran out of clean clothes. Caretaker, Dave, gave Lana 10 gallons of hot water and some laundry soap. Scott loaned her a clean fleece top until her clothing dried out. It was a small gesture, but Lana was grateful for his kindness. I was and, to this day, remain confused over his generosity. On the other side of the personality spectrum was Matt Carpenter. He was fun loving, friendly, and charismatic. A few days into our stay he sat down with several of us on the front porch of the main cabin. We talked about trail runs, races and competitors. He entertained us with tails of the Everest Marathon series and the marathon up the mountains in Kenya. His stories were fascinating: there was a noisy Russian chopper ride up to Everest base camp and the roped trail run through the snow in Kenya. Matt was not all racing; he liked to have fun too. About the end of the second week, I ran into Carpenter after a harrowing run back from Bottomless Pit. Hed found an old submerged mineshaft and was attempting to drain it when the afternoon thunderstorm came down over the mountain. The lightning chased him the 4 miles back to camp. I was in causal conversation with Jeff, the caretaker, when Matt came to thank him for the use of the shovel. Carpenter joked, I didnt know whether to hold the shovel above my head, or down close to the ground. Had it been me, I would have stowed the implement and hightailed it back with urgent purpose, but Im not as well conditioned as Matt. Five days into our stay, Lana and I made our second ascent. Our mission was to get a birthday present for Joyce. We loaded up the Camelbacs early, about 9:00 AM. Caretaker, Jeff, scanned the skies with us, You going up today? There was a storm coming in early, which meant no lightning, but plenty of water vapor. You know me, I said. Lana and I buttoned up our Goretex and shuffled off. At timberline we penetrated a cloudbank so dense that several times I lost sight of Lana just a few short yards ahead of me. Up near the G. Inestine B. Roberts Memorial, we came upon a pair just as they were donning raingear. This was pre-9/11 America and these guys turned out to be pre-9/11 Army Special Forces. How could we tell? They trained in heavy boots and fatigues, and there was that Ranger patch that one of them wore. Then I just came out and asked them about their unit. Other US Army units train on the mountain, but we seldom saw them out in murky weather. If I knew then what we all know now, I would have wished them speed and luck, and good hunting. I often wonder if they made it to Afghanistan and if they did, whether they would make it back. In minutes they disappeared into the gloom to complete their own mountain mission. Higher, we went. My altimeter read 13,500 feet, but the falling barometer made me unsure of the actual height. About then, I caught a glimpse of Lana not thirty feet away. She stepped to the edge of the Cirque. It was a 1,500-foot drop to the bottom of this cliff but we couldnt see it, only the dense cloud and pelting rain. There she was, cloaked in storm gear, in the swirling mist, at the edge of the abyss. Then in a moment, a beam of sunlight framed her silhouette in yellow light. When my sight fades, Ill still be able to see her there, burned vividly in my memory, a woman in ascension; a work of art. The moment was fleeting. The mist closed in once again. Near the summit we passed an Amish family, gleefully tumbling down the mountain with great gusto. They would wait out the weather at Barr Camp before continuing the next morning. Then, there was the summit. We snacked at the café and purchased a pair of Pikes Peak souvenir socks for Joyces birthday. The trip down was fast. We were sure footed that day and the rocks didnt seem to be that slick. This ascent was indeed pleasant. I can only thank my wife Lana for making it so. I felt like I was pumping pure adrenalin. I rehydrated in the café and started the trip back down. Near the two-to-go marker I passed Lana. She was chatting to a fellow trekker on the way up to the top. This marked her third ascent in 8 days. I was so very proud of her. It was a good day to be on the mountain. There were other runs before our decent down the mountain, though much of the last week was spent hiking these gorgeous trails. We covered Elk Park, Mountain View, and Bottomless Pit Trails as well as Barr Trail. We wanted more of this adventure. Our stay was drawing to a close much to soon! On August 16 we were scheduled to take the Cog down from Mountain View, reversing the path of our arrival. It was August 15; I caught up with Matt one more time before race weekend. I asked again, Will you do the Marathon? He said candidly, The only way I would race the Marathon is if I could complete the Ascent with the winning time. I expressed my wish that I wanted him to do just that; that every marathoner wanted to run against the very best competition. I had selfish motives in his primary success. I joked with him, saying he could provide a doubles record! He laughed it off, explaining that record times required a special sort of competitive field. Matt believed that great things are accomplished when an element of fear is added. The competition must be able to scare you into the performance of your life. We spoke more of other things but even at that late juncture, he never tipped his hand over what he was planning. The next morning, we took the Cog back down to Manitou S prings. On Saturday, August 18, Matt Carpenter stepped into his preferred spot on the left hand side of the Ascent race starting line. He showed up moments before the starting gun (actually an air horn). In an effort that silenced all speculation, he mopped up all the competition by finishing over 4 minutes ahead of Scott Elliott. Scott came in a distant second. Did that mean that he would compete in the Sunday race? I got ready for the 46th running of the Pikes Peak Marathon. I never did see Matt at the start of the Marathon. I was pretty busy wrestling with my own demons, but Joyce Taylor saw him come in over to the left side up front. She came over to me and simply said, Matts here. We took our own spots and got ready for the start. It wasnt a long wait. At the blast of the horn, and we were off. The previous year was one of embarrassment. Even though I finished the race, I was disappointed with my time of 8+ hours. It was time to do great things. I started off at a slow trot, knowing that this race had to be run from within. I used my heart rate monitor like a tachometer, keeping my heart rate at 150 bpm. I made some other adjustments. This year I eliminated conversations with other runners. I figured I spent too much energy and oxygen in this manner the previous year. OK, so Im a fan. Go figure. Moments later he disappeared. Just above the two-to-go marker, I began to feel the excess heat. It had been warmer than the previous year. The water I was taking in was not doing the job. I was dehydrating. Its about that time that Steve Kanters caught up to me again. I must have been looking pretty miserable. He asked me how I was doing. I took a last pull from my water bottle. Im out of fluids, I said. I gulped down a mouthful of Steves water and held it over my shoulder for him to grab. Then came the 16 Golden Stairs. The stairs consisted of an ascent over a boulder field. Steve had passed me and was increasing his lead. It was time for a gut check. The ascent portion of the race was within my grasp, but I was hypoxic and not thinking clearly. Then, I was at the top. An official marked my bib number. I drank more water and refilled my own bottle. The topside digital clock read 4 hours and 31 minutes. I missed my goal. I wheeled and headed back down through the thin air, wracking my oxygen starved brain for a way to make up the lost time. About 500 feet from the turnaround I fell. Spring water seeping across the trail made flat stones slick. I missed my plant, slipping, cracking my head against a Volkswagen-size boulder. Things went dark for a moment. When my senses came back, I was squinting up into the silhouetted face of another runner. Are you OK? Do you want me to stay with you? he asked? No, I said numbly, Its a race. He continued on. It took me a couple of minutes to get to my feet. I inventoried my cuts and bruises. I stood up and taking one ginger step at a time, I continued my decent. Later, on a lower stretch of switchbacks known as the Ws, I fell again suffering only leg and knee abrasions. The Gazette reported half a dozen runners were sent to the hospital with possible fractures that day. I wasnt one of them. An hour later I was lumbering down Ruxton Avenue toward the finish. The temperature was 90 degrees. I was out of steam, but I made it. Steve had cruised in a cool 6 minutes and 40 seconds ahead of my 7:19:51 time. I had missed my personal goal by about an hour. Still, I managed to chop almost 50 minutes off my previous time. I collected my medal and goody bag. I thanked Steve for the water. Lana was there to greet me. She had seen Matt cross the finish. He was a double champion. It was the first time in the history of the race. My God, I thought, He did it! Carpenter was already gone when I got there. Joyce Taylor was still hanging around. She screamed in at 6:23:01. She came over to say goodbye. We all started drifting away. Our two-week adventure had come to a close. In the end, its only a race. Or is it? I have decided he is right. The race defines the individual. It shapes who I am and how I interact with the rest of the world. It teaches me tolerance and perseverance. It inspires me and gives me courage. It must be that darn mountain. Or maybe its the sport of skyrunning in general. Would I do it again? What do you think?